How I Gained It: Who really knows how it happened? Unlike many others, my eating wasn’t triggered by a traumatic childhood event or even any sort of earth-shattering event. I was an overweight as a child, teenager and adult. I just love to eat. I didn’t eat for comfort or out of boredom — I just loved food. The more cheesy, sugary, creamy, salty or crispy, the better. As long as it wasn’t green and healthy, I could eat it. Breaking Point: My breaking point happened when I started to get chest pains. I work for a doctor, but for the first time in years, I finally put myself on my doctor’s schedule as a patient. An EKG told me that I wasn’t having a heart attack, which was a relief, until my doctor pointed out that it was only a matter of time until it was the real deal. She told me it wasn’t an if but rather a when. She also ran some routine lab work and discovered I had type 2 diabetes. That scared me. Working for a physician, I’ve seen many patients battle something that is in many ways preventable. She told me that if I didn’t get my self in gear, I wouldn’t live to see my two-year-old grandson make it through high school. I figured that was the time to decide whether I wanted to live life or get ready to leave it prematurely. How I Lost It: I’m a great project starter, but it’s not too often that I actually finish it. Take needlepoint for instance — my designs get a great start, but it’s usually five years until I finish them … if I do manage to finish them, that is. Weight loss efforts had always been the same, but I was finally at a point where I knew I had to do something. So I started another project, with the hope that I would actually stick to this one. I had already owned the South Beach Diet book set for two years, but I finally decided to get serious so I dug them out, dusted them off and headed down to the supermarket to stock up on low-carb foods. Saying goodbye to mashed potatoes and breads was hard and the road ahead was daunting. 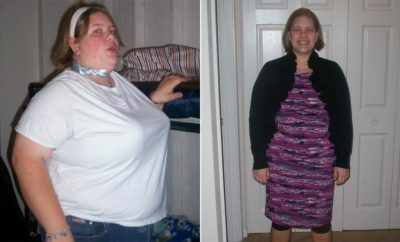 At over 300 pounds, I had to lose 100 pounds just to get from morbidly obese to plain old obese. To this day I don’t know how I did it, because temptation was everywhere in the form of office sweets and work lunches at the Olive Garden. But somehow I managed to resist and I lost 12 pounds in the first week. That was enough of a push to propel me into the next week. By the end of that month, I had lost 30 pounds. I had a lot of support from family, friends and co-workers, which I am forever grateful for. My husband did a lot of fending for himself — there were nights I cooked things he didn’t want to eat, but he made do with soup or a burger. He learned to like low-carb foods and didn’t complain when his favorite mashed potatoes became a rare treat. Colleagues and patients started bringing nuts or non-food goodies for me to the office along with the cookies and doughnuts for the rest of the staff. They cheered me on every step of the way. My co-workers even threw a South Beach-friendly party for me when I reached the 100-pounds-lost mark. I also started walking in the evening for exercise. In the beginning, I couldn’t walk a block but as time went on I was able to do two miles without becoming winded. I now work out at a gym and really enjoy it. However, don’t think it was easy. It took me 725 days to hit my goal weight, and during that time I hit numerous plateaus that were disheartening and frustrating. 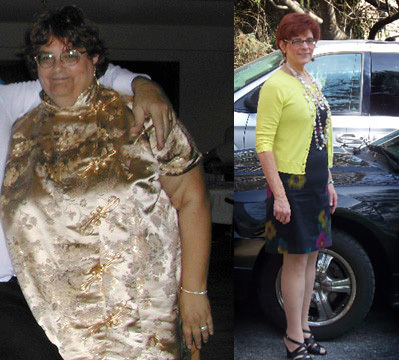 The last 50 pounds took over a year to lose and the last 20 pounds took several months — but I didn’t give up. I never cheated or reverted back into my old habits because I knew if I allowed myself to indulge, I might never get myself back in line. Even after all that time, I knew my hold on my relationship with food would always be precarious. 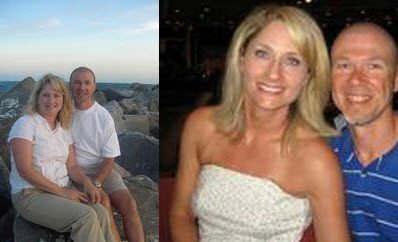 But despite all the setbacks, on December 29, 2007, the scale read 158.7 — 1.3 pounds below my goal of 160 — and I was completely overjoyed. I had actually done it — it was the most important project of my life, and it was finally finished! I had lost 174 pounds and burned 609,000 calories. That day was truly the first day of the rest of my life. After losing over half my weight, I’m proud to say that I’m no longer diabetic and my blood pressure medication has been cut in half. Every little milestone has given me the motivation to keep going forward. Over the last two years, I’ve taught myself how to live — I’ve learned about moderation, setting goals, and sticking within my limits. I’ve become a stronger more confident person. Some would think that the day I reached my goal was the best day in my life. Not so — my best day was just a couple of weeks ago. I bought a bike and my grandson and I went bike riding. He took me to the park near his house and we spend a couple of hours on the swings and the slide, racing each other up and down the jungle gym. I couldn’t have done that three years ago! My only regret is that I didn’t embark on this journey 30 years ago because I missed out on that wonderful experience with my own kids. Now that Maryann is half her weight, she’s re-discovered her love of shopping and is happy to be shopping in regular stores for the first time in years. 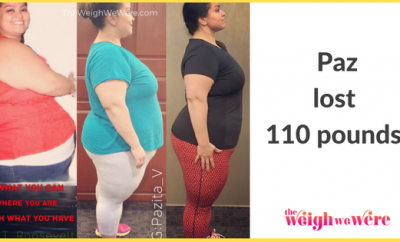 ← Previous Story 90 Pounds Lost: Finding true beauty!